Motherwell FC’s new wing sensation Gboly Ariyibi is confident that the Steelmen can achieve a coveted top six finish in the Scottish Premiership this season, writes Craig Goldthorp. Nottingham Forest loanee Ariyibi (24) has been in scintillating form since joining the Steelmen in January and had another fine match in Saturday’s resounding 3-0 home success over Livingston which put ninth placed ’Well within seven points of St Johnstone in sixth. “I think we can get top six this year,” Ariyibi told the Times and Speaker. “We’re confident. We’re taking every game as it comes. “We’re looking confident with how we’re playing as well. “And there’s a buzz about the place at the moment. So we just need to keep winning games and doing well. “I’m in the team to do a job. Whether that’s beating my man, scoring goals, getting assists, whatever’s best for the team. And with games that will come. If Motherwell are to finish in the top half when the split comes after 33 games, then their away fixture against St Mirren tonight (Wednesday) looks like a ‘must win’ game for them. 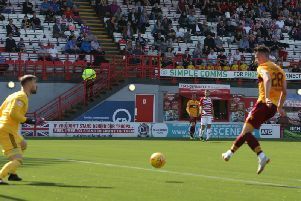 USA-born Ariyibi thinks that the three points in Paisley is a distinct possibility if Motherwell can replicate their stunning form from Saturday, when they were 3-0 up within 20 minutes thanks to a double by Jake Hastie and a Curtis Main strike. Ariyibi added: “Yeah, the St Mirren game is must win, we want to win every game. “We go there and hopefully play as well as we did against Livingston. “It was important to stick to our game plan against Livi. Ariyibi said that it’s exciting times for Motherwell, with talented youngsters David Turnbull, Hastie and Allan Campbell in the team’s engine room. “I was a young player once, on loan and getting games,” added Ariyibi, who was formerly on loan at Tranmere Rovers, MK Dons and Northampton Town. Ariyibi has two years left on his Nottingham Forest contract but is loving life in Scotland. He said: “I’m enjoying my football at the moment. “The manager’s really good, he’s given me confidence. It’s a good team, a good set of boys as well, so who knows? “The Scottish league is very intense, it’s different.